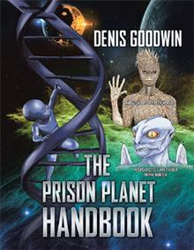 Denis Goodwin enters the publishing scene with the release of “The Prison Planet Handbook” (published by Xlibris NZ), a book that challenges readers to make the paradigm shift and get a better understanding of man’s place in the universe. In “The Prison Planet Handbook,” Goodwin takes a look at science and reality from a bigger picture. By tying together actual experiences people have had and witnessed first-hand, he looks past and beyond a secrecy that has kept people’s mind in a restricted illusion of reality. The book, the author hopes, may throw a bit of light in a very secret corner or act as an incentive or guide for a more in-depth look at things with at least some of the dirt tracks to nowhere barricaded. To purchase a copy and know more about the book, readers my visit https://www.amazon.com/Prison-Planet-Handbook-Denis-Goodwin/dp/1543495168. Denis Goodwin is a dairy farmer. “The Prison Planet Handbook” is his first publication. This book is intended to be a follow-on or adjunct to the website, http://www.PrisonPlanetRevelations.com.